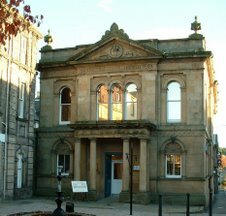 Yesterday, 78 people attended a display and talk on Forres High Street of old in the Library. Graeme Wilson, Local Heritage Officer, gave the talk in front of an appreciative audience. Unfortunately I was unable to attend through illness but Rebecca Bolton, Community Librarian did the introductions and was delighted, though somewhat surprised, at the large turnout. The Friends have produced a 5 foot long plan of the High Street as it was in the 1940. The information was supplied by Ross and Vallie Dalziel and the painting by Jean Mortimer. Space has been left so that members of the public can add post-it notes with details of shops they remember. The Friends also put together a small exhibition of items which came from old High Street shops. Included in the items was a cash box from the local branch of The City of Glasgow Bank. This Bank was the last Bank to have collapsed before the Northern Rock fiasco of this year. The exhibition and plan will be shown in the Library until 3rd March when the public will be invited back to discuss their reminiscences of Forres High Street. hi ppl. I'm actually into shoes and I had been digging for that singular brand. The prices as regards the shoes were around 190 pounds on every page. But definitively I base this area selling them someone is concerned half price. I in reality like those [url=http://www.shoesempire.com]gucci sneakers[/url]. I will absolutely buy them. what can you say about it? What's in the training ? Your best bet would be to ask for a performance demonstration to check out the max capacity of the vehicle. The machines are best suited for extensive lifting where one gets to see all possible weights through to the end. The higher the price is, the more is the commission going to be.